Tanks are very important in our life!! How? I am an army officer’s wife, that too in armored!! so, life surely revolves in and around tank. 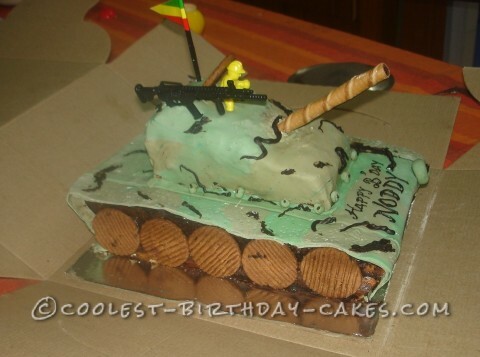 Moved to a new place, and my friend requested for a tank cake for her son! Can’ts say no too, but absolutely no idea where will I get my required material. Starting from chocolate itself . Anyhow, first task was the detailing of the tank which I thought won’t be a problem. But surely enough my husband was rejecting my drawings of the tank. Finally… passed! The worst was still yet to come!! Now detailing on the cake itself! The most difficult part for me was to get the camouflage color correct. Again , army man’s approval was very important as the birthday boy’s father is an officer too..( sob..). But finally, after 2 days of struggle, I completed it, and was so proud of the result. The cake is a chocolate cake with ganache filling and topping. The flag, gun, and the soldier are not edible.